See-Dub: A celebration of fathers. 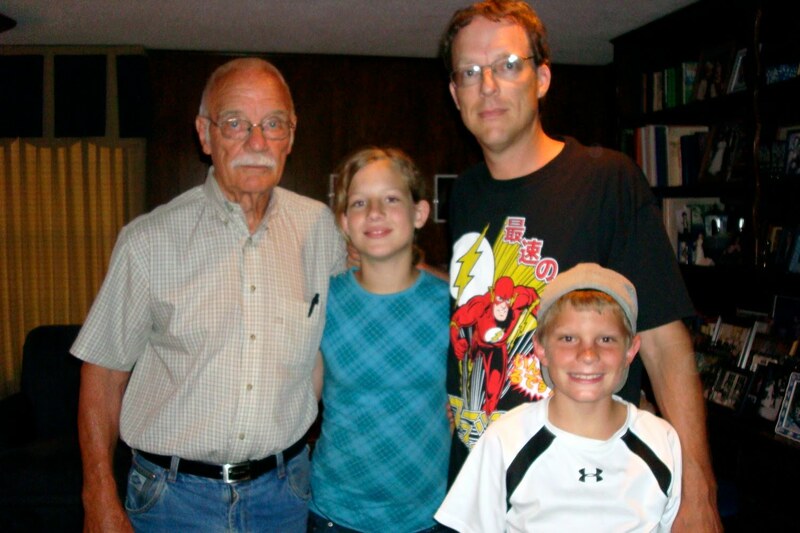 After sending Ryan off to church camp, we paid a visit to Brett's dad to wish him a happy Father's Day. We love our Papa, so it was good to be able to spend a few hours with him. It was also a treat to hang out with Brett's cousin Rick and Rick's son, Ben. Ben's baseball team had a tournament nearby over the weekend, so we got to visit with them in between games. Father's Day got me to thinking about how much our fathers help shape us as children, so I dipped into the ol' archives for some pictures of us with our dads. 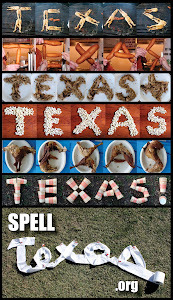 Brett and I both love this photo. 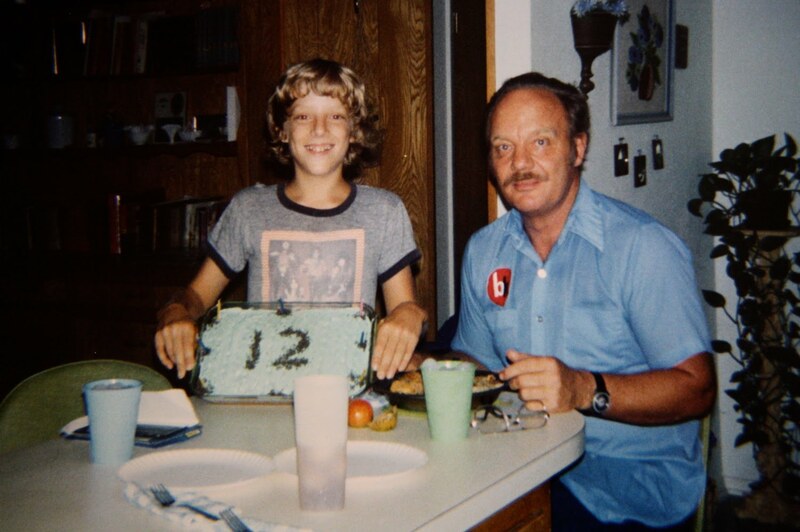 He loves it because of the KISS T-shirt he's wearing and that his dad has on his Bell Helicopter work shirt. 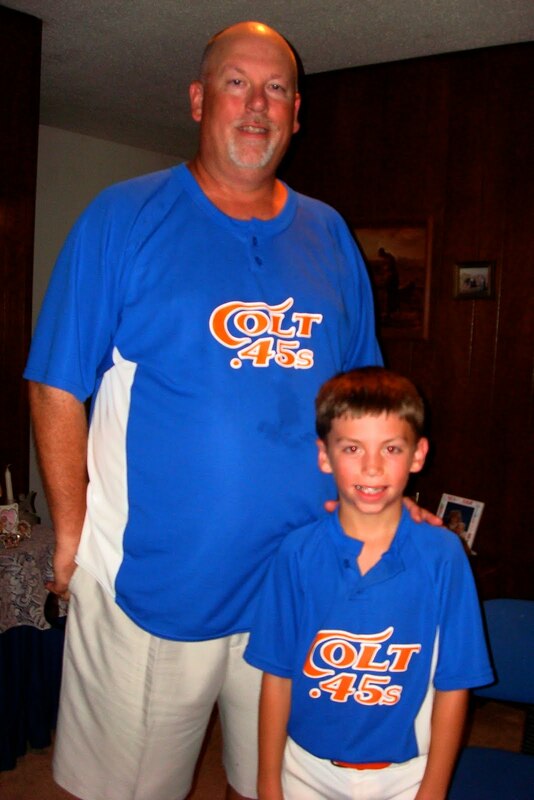 (Brett gets his incredible work ethic from his dad.) I love it because Nana still makes birthday cakes for us and takes our pictures sitting pretty much in that same spot! 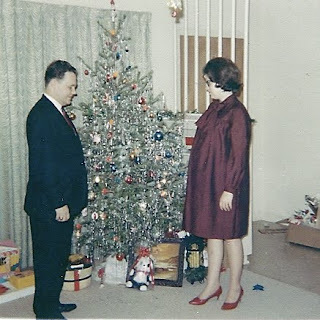 These are my parents at Christmas 1967. That panda under the tree was my first Christmas present, but it would be another month before I'd be able to receive it! 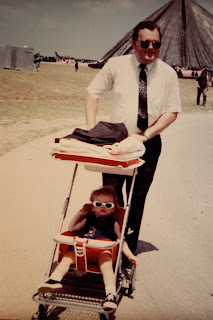 Another photo I adore: Daddy with me at an airshow when I was 1 or 2. He shed his jacket, but he's still wearing his tie! 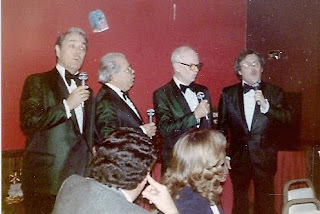 My dad loved to sing, and for a few years, he sang with a barbershop chorus and quartet. Barbershop music will always remind me of him. Certain church songs also make me think of Daddy ("It Is Well With My Soul," "The New Song," etc.). It's almost painful to hear them because I can remember him leading them so well. 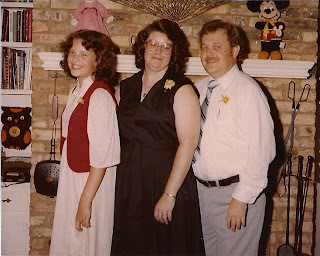 Here we are in front of our fireplace during Granny and Papa's 50th wedding anniversary reception. 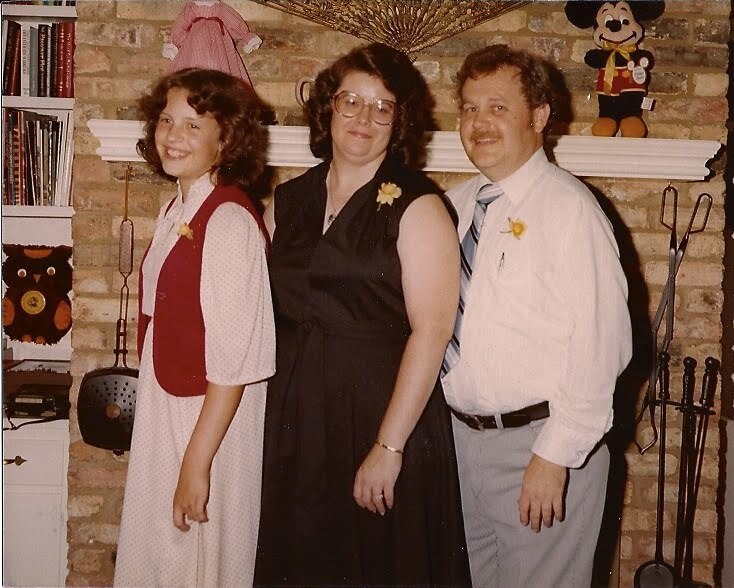 I love that you can see the owl I made in school, the porcelain doll Daddy bought Mama in Gatlinburg, and the Mickey Mouse we bought at Disneyland in '78. And that fan. That fan was above our mantel for YEARS. 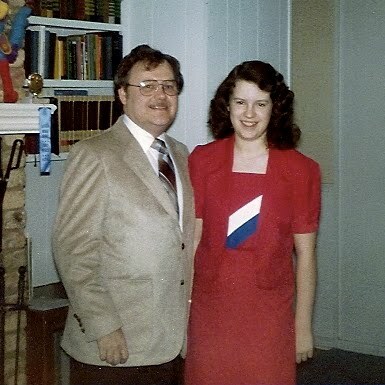 I miss Daddy terribly, but I'm so thankful for the 26 years I got to spend with him!